Methods undertaken by the Delhi government to improve air quality over the city may work in small and isolated regions like the Kathmandu Valley. They won't over the Indo-Gangetic plain. As soon as the monsoon retreats, the Indo-Gangetic belt from Islamabad to Bangladesh is engulfed in air pollution. Several governments – notably that of Delhi – have been trying to improve the air quality using quick fixes like cloud-seeding. As precious public money is being spent on these methods, it is important to understand if they can really work. After the monsoon retreats in September, and until it returns in June, the air over this region sinks almost to the ground. This phenomenon is called atmospheric subsidence. And such widespread subsidence over the Indo-Gangetic plain keeps a lid on the atmosphere in this region. Somewhere near the ground, the subsiding air starts going sideways because it can’t pass through the ground. This action separates the vertical atmosphere into two layers: the boundary layer, in which all human activity occurs, and the free atmosphere above the boundary layer. These two layers don’t mix. Air in one layer can’t enter the other one easily. The boundary between them is called the inversion layer. The free atmosphere has fairly fast-moving winds that can transport air, including pollutants, over long distances. The boundary layer is less mobile, causing chemical and particulate matter to accumulate in it. Because these layers are insulated from each other by the inversion layer, the pollutants can’t leave the boundary layer. Similarly, they can’t descend from the free atmosphere into the human layer. The overall effect is humans to be stranded in an atmospheric cage. Atmospheric subsidence over the Indo-Gangetic plain inhibits the formation of clouds, together with very low humidity. With reference to the figure above, clouds can’t form in the parts coloured red . This coincides with the October-March period. 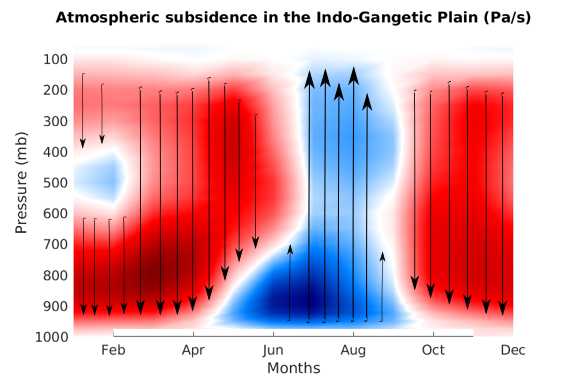 When the subsidence is negative and the air rises more easily, typically in the June-September period, clouds form more easily. There are exceptions, of course. For example, the inversion layer is breached when specific weather events, simply called western disturbances, occur. But notwithstanding exceptional circumstances, it is nearly impossible to modify clouds and augment rainfall. 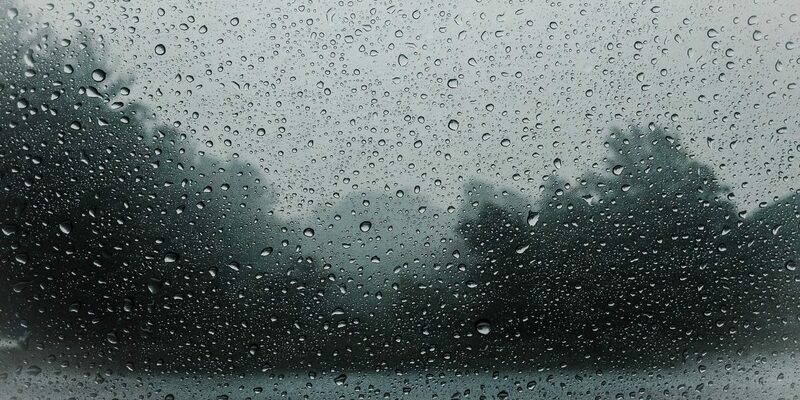 If clouds do form, such as during the monsoon season, they themselves will transport pollutants into the free atmosphere, and from there across large distances. We don’t have to do anything. These conclusions severely limit what we can achieve using cloud-seeding exercises. The prevailing theories and numerical models of cloud and precipitation formation are valid for regions with higher water-vapour concentration. Moreover, today’s science and technologies of cloud-seeding don’t initiate rain. Cloud-seeding only claims that – if it rains naturally – it may be able to augment the volume by 5-10%. For example, several newspaper reports have mentioned that China conducts cloud-seeding to mitigate air pollution. It is true that it undertook such exercises to prevent rains during the Beijing Olympics. However, it is not true that cloud-seeding was used to mitigate air pollution. Assuming a technological solution exists to improve air quality in a given location, how effective can it be? In the presence of an inversion layer, the boundary layer is said to be stable. The boundary layer also intermittently hosts turbulence that mixes the air and fills gaps. If the Delhi government manages to exile the airborne pollutants over its jurisdiction, the turbulence will simply mix the clean air with the dirtier air around it and restore the former level of impurities. The effective time-scale for this process is about 20 minutes. In other words, the concentrations of pollutants are built up again in a third of an hour. So such methods as undertaken by the Delhi government (and suggested by the Delhi high court) may work in small and isolated regions like the Kathmandu Valley. But they will be ineffective in large polluted regions like the Indo-Gangetic plain. Conversely, strategies to mitigate air pollution over Delhi can’t be derived from solutions that may have worked over smaller areas. For example, Delhi has adopted some emission standards originally designed for Europe. However, these standards work with Europe’s weather in mind. If they are to prove effective in India, they will have to be redesigned to work with atmospheric conditions over the plain, and based on sound science. An easier and more affordable way to tackle pollution is to identify its sources, devise suitable policies and implement them effectively to lower emissions from those sources. This has been the experience around the world, from Los Angeles to China. Our meteorological milieu can’t be changed, nor can we hope to modify the weather at such scale. Further, it takes considerable time and effort to understand the physics and chemistry of pollution in this region and properly attribute it to the right sources. On this front, government initiatives like SAFAR are laudable. Nonetheless, the march towards mitigation should be commenced as soon as possible. It’s a difficult problem and there are no easy solutions. Udaya Bhaskar Gunturu has a PhD in atmospheric science from the Massachusetts Institute of Technology, and has been working on related issues since.